The American funeral industry emerged in the aftermath of the Civil War, picking up steam at the turn of the twentieth century and gaining economic power by the middle of the century. Although the industry has long been the object of scathing public attacks, local funeral homes across the country have won respect as established and trusted places of business and as a source of comfort for families suffering from the loss of a close friend or relative. Variously called "undertakers," "funeral directors," and "morticians," America's new ritual specialists have transformed the twentieth-century experience of death and body disposal. The foundation of the emergent industry was embalming, a practice that gained legitimacy during the Civil War years. Although medical schools before the Civil War relied on various European methods of preserving dead bodies for instructional purposes, most Americans had no knowledge of the procedure and abhorred any "unnatural" intervention into the body's organic processes of decomposition. In antebellum America, the integrity of the dead body, even one disintegrating in the coffin, had to be preserved at all costs. Even though it might be placed on a cooling board, the interior of the corpse was generally not accessible to prying eyes, hands, or medical equipment. During and after the Civil War, embalming became acceptable to more Americans who wanted to ensure that, no matter what, they could have a last look at their lost loved ones. Many Northern families who could afford it arranged to have the sacred remains of their fathers, sons, brothers, and husbands shipped home from Southern battlefields. They hired death specialists who found innovative methods, including arterial injection, to preserve bodies for the long journey home. Thomas Holmes, one of the pioneering founding fathers of the modern funeral industry, perfected his skills and made a dramatic impact on his fellow undertakers during the Civil War. A critical turning point in popular awareness of embalming, and in legitimating it as a permissible American practice, was the cross-country journey of Abraham Lincoln's body after the war. Hundreds of thousands of people filed past the viewable body on display in cities from Washington, D.C., to Springfield, Illinois, and newspaper reports provided the public with graphic details about embalmers, whose methods were central to preserving a sacred relic that ritualistically united Americans after the divisive and bloody war. After the Civil War, increasingly more undertakers began to experiment with embalming as an alternative to other modes of preservation. By the early decades of the twentieth century, embalming had become a standard practice in much of the country. American undertakers, many of whom had connections with the furniture industry and had a growing interest in the production of coffins, began to focus on the transformed appearance of the body. Embalming assumed a central place in American burial practices for a number of reasons. First, instructors representing embalming chemical companies traveled the land, offering courses in the trade and conferring diplomas that signified professional expertise. In time, many of these companies established full-fledged mortuary schools. In addition, states began to recognize this modern professional occupation through licensing boards made up of established funeral directors and other civic leaders. Second, the rhetoric surrounding embalming relied on contemporary theories about public health and sanitation; many argued that embalmed bodies posed less of a threat to the health of a community than bodies left to rot in the ground naturally. Third, an entirely modern funeral aesthetic emerged in these early years, based in part on chemical company assertions about the value of providing mourners with a pleasing, well-preserved, and viewable corpse. Fourth, embalming proliferated because of an industry-inspired mythology that portrayed current practices as a technological culmination of ancient sacred rites dating back to ancient Egypt. Finally, embalming seemed to respond at some level to the needs and desires of Americans from a variety of ethnic, racial, and religious communities. The rapid spread of embalming spurred the equally swift emergence of funeral homes across the country in the first few decades of the twentieth century, as American life was transformed by urbanization, medical advances, and the increasing prevalence of scientific attitudes and perspectives. Undertakers no longer traveled to the home of the deceased to prepare the body but instead transported corpses from the home or hospital to the funeral home. A melange of business, residence, religion, and consumerism, the funeral home rapidly became an American institution in local neighborhoods. Funeral directors lived with their families in these homes, and very often wives and children worked with the father in preparing services for people in grief. Whether they helped friends, neighbors, or acquaintances, everyone who walked into the home shared one thing in common: They were customers engaged in a financial transaction. 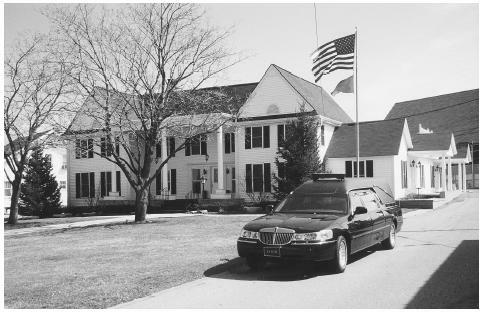 Lynch & Sons Funeral Home in Walled Lake, Michigan, has been a family owned and operated funeral home for over fifty years. The Lynch family, in its third generation of funeral directors, has chosen to remain privately owned while some others have sold to large multinational corporations. the industry, which was generating billions of dollars per year in economic activity by the end of the twentieth century. While the changing nature of funerals created an industrial juggernaut over the course of the twentieth century, the public image of funeral directors has been constantly tarnished by bad press, ugly controversies, and negative stereotypes. Although they have referred to themselves as "professionals," undertakers have had a difficult time convincing the public that this title should apply to an occupation that does not require a college degree—hence the gaping divide between the self-image of funeral directors as well-respected, active community members and the popular, media-fostered stereotype of the heartless, corrupt, and exploitative swindler. Critics attacked modern American funeral traditions for a variety of reasons. The most obvious, and popular, line of attack was economic. The high cost of funerals seemed outrageous to many who claimed that vulnerable families—especially poor families—consumed by grief and guilt had no choices and could not fully comprehend what they were purchasing when making funeral arrangements. Additionally, early on in the twentieth century many undertakers engaged in deceptive business practices, such as adding a range of costs for nonitemized services onto the price of the casket. Community and religious leaders, politicians, academics, and other public critics launched formal and informal investigations into the industry, and often produced lengthy, highly publicized reports that the media boiled down to accessible, readerfriendly stories that filled newspapers and popular magazines. Many reports tended to focus almost entirely on the economic angle, although explicit references to cultural and class differences frequently came into view. For example, many investigative reports claimed to have the interests of the lower classes in mind when making recommendations about curtailing the costs of funerals. According to these reports, the poorer segments of American society, such as immigrants from Italy or Ireland, spent lavishly on extravagant funerals because they were ruled by irrational, emotional impulses that were manipulated by unscrupulous undertakers who encouraged them to spend beyond their means. In addition to the economics of burial, many articles highlighted frequent religious criticisms of the American funeral. Not surprisingly, the focus in this regard was the embalmed, nicely dressed, presentable body displayed in an open casket for all to see. In the view of such critics, rather than expressing the highest values of an advanced civilization, this attention on the physical body was a debased form of paganism. They attributed this fixation on the corpse to a combination of irrational, primitive desires among the uneducated masses, and scandalous, dishonest practices by funeral men encouraging secular materialism. The popular press frequently covered the high cost of funerals during the first half of the twentieth century, but one book published in 1963 made a dramatic, indelible impression on American public's perception of the funeral industry as nothing had before it: The American Way of Death, written by the English-born Jessica Mitford, simply restated earlier criticisms that were already familiar to most. But what made the book a runaway best-seller was Mitford's style of writing, an effective mixture of humor, muckraking, outrageous anecdotes, and exposé. The book struck a chord in American popular culture at a time when consumer consciousness and empowerment began to play a much larger role in the habits and tastes of the American buying public. It also resonated because by the time of its release, the stereotype of the money-hungry, insensitive, buffoonish undertaker had already emerged in the American cultural imagination. One of the first was a hilarious, though brutal, episode in Mark Twain's Life on the Mississippi (1893), which depicted the author's encounter with an old friend who is now happily making a living burying people. A variety of subsequent similar representations gave shape to the popular, one-dimensional stereotype, including Thomas Wolfe's Look Homeward, Angel (1929); J. D. Salinger's The Catcher in the Rye (1951); the radio program The Life of Reilly with the famous character, Digger O'Dell, "the friendly undertaker"; the film The Loved One (1965), adapted from Evelyn Waugh's 1948 book; and television shows all contributed to the vitality and familiarity of the stereotype by the early 1960s. Mitford's book reaffirmed, as well as revitalized, the stereotype. It resonated with Americans hooked on sensationalism and accustomed to the vile antics of modern death specialists. Men and women in the funeral industry responded to Mitford in the same way that they had responded to earlier criticism. They engaged in intensive national public relations campaigns that included the production of numerous brochures and pamphlets, made efforts to educate their local communities through open houses and other events, and tried to defend the American way of death in the media when given an opportunity to present their case. In most instances, they claimed that the traditional American funeral—which included an embalmed body, cosmetic touches, an open casket, and a last viewing by mourners—expressed respect and honor for the deceased, represented patriotic American values, and responded to the deepest desires of the living who wanted to do right by their dead, regardless of what so-called experts might have said. Industry representatives argued that most Americans did not want to handle their own dead and get them ready for burial. Any suggestion that the industry should be controlled by the government, these representatives warned, would lead to socialism and, ultimately, the destruction of democracy and the free market. Additionally, by the time Mitford's book was published, the industry had elaborated a theoretical basis for the modern funeral that relied on increasingly popular psychological language to justify its practices. In the early years of the industry, the reigning paradigm surrounding the professional duties of funeral directors was limited to his expertise in the area of embalming, running a successful business, and managing the funeral services. In time, another area of expertise that dominated industry rhetoric related to the psychology of grief, and, more specifically, the psychological value of viewing a pleasant-looking body in repose. On the one hand, members of the industry asserted that the last look provided the bereaved with an undeniable message that death had occurred. On the other hand, gazing at the sacred remains initiated a much longer process of healing because it offered those in grief a lasting image or "memory picture" that erased many of the negative images coming to be associated with dying (i.e., being hooked up to tubes and wires in an impersonal, antiseptic hospital setting or seeing cancer disfigure the body of a loved one). The funeral industry strongly promoted a psychology of grief that shaped public arguments and led to a range of additional services that many funeral homes began to offer their customers, such as after-death bereavement counseling. In the wake of Mitford's book and the recurring media reports on corruption within the funeral industry, a number of significant changes swept the country, although none really threatened the economic muscle and cultural authority of America's funeral homes. The Federal Trade Commission began its own investigation of the industry in the late 1970s and issued a series of proclamations based on its findings, including the Funeral Trade Rule in 1984. Some of the regulations imposed on funeral directors included providing clients with a detailed price list of all goods and services, informing them that embalming is not required by law, and allowing families to plan alternative funerals that did not follow traditional patterns. Governmental requirements of full disclosure, along with larger shifts in U.S. mores during the 1960s and 1970s, left a permanent imprint on American mortuary practices. For example, in response to growing popular desires to craft personal ceremonies that were unique to the life and personality of the deceased, the industry began to loosen traditional rituals invented and perpetuated by funeral directors in the first half of the century, encouraging an embrace of "adaptive" funerals that catered to individual and community needs. In the midst of these changes, the funeral industry increasingly adapted to consumer demands, although funeral directors continued to play a central role in the interment of the dead. Even though many from the older generation resisted such changes and called for a return to tradition, younger, more progressive funeral directors simply changed with the times and expanded the range of services and goods available at local funeral homes. By the early decades of the twentieth century, African-American, Jewish, Catholic, and other ethnic and religious communities had their own funeral directors to take care of their dead. When a range of new communities sprang up in metropolitan areas after the change in immigration laws in the 1960s, many funeral directors began to offer services to Vietnamese, Latino, Eastern European, and other immigrant families that did not yet have their own funeral homes to which to turn. The funeral industry began to see a tremendous increase in Buddhist, Hindu, Confucian, and other non-Western religious rituals taking place in funeral homes across the country. In the first half of the twentieth century the industry had promoted cross-cultural knowledge of the world's funeral customs throughout human history, but up until the later decades of the twentieth century, funeral directors never had hands-on experience with these traditions. Perhaps the most important development to emerge after Mitford's book was cremation. Although cremation had made its appearance on the American scene much earlier, it became a viable option in the late 1960s and grew in popularity in subsequent decades. At first, most imagined this option to be a mortal threat to the traditional funeral; the incineration of the body, with no embalming, no viewing, and no religious ceremony, posed an unprecedented dilemma for funeral directors around the country, who did not have the resources, technology, or tolerance for such an unusual mortuary practice. But as the cultural landscape began to shift, and as more Americans grew tolerant of the practice, the industry found ways to accommodate the growing numbers of people who desired burning bodies and ceremoniously disposing of the ashes. Cremation rates at the turn of the twenty-first century rose to 25 percent. As more funeral homes built their own crematoriums or contracted with independently owned facilities, the industry found ways to adapt to the popular practice. Cemeteries have built columbaria, merchandisers have produced a range of stylized urns, and funeral homes have established new ritual patterns, including some that retain more traditional elements, such as viewing an embalmed body before putting it to the fire. Another significant trend to emerge in the closing decades of the twentieth century was the intrusion of multinational corporations into what has become known as "death care." Inspired in part by the aging of the populous baby-boom generation, big corporations like Service Corporation International and the Loewen Group have been buying up independent, family-owned funeral homes. Even though most funeral homes are independently owned and operated, these corporations will continue to play a major role in U.S. funerals well into the twenty-first century. Bowman, LeRoy. The American Funeral: A Study in Guilt, Extravagance, and Sublimity. Westport, CT: Greenwood, 1959. Habenstein, Robert W., and William M. Lamers. The History of American Funeral Directing. Milwaukee: Bulfin, 1962. Huntington, Richard, and Peter Metcalf. Celebrations of Death: The Anthropology of Mortuary Ritual. Cambridge: Cambridge University Press, 1979. Kearl, Michael C. Endings: A Sociology of Death and Dying. New York: Oxford University Press, 1989. Laderman, Gary. The Sacred Remains: American Attitudes toward Death, 1799–1883. New Haven: Yale University Press, 1996. Lynch, Thomas. The Undertaking: Life Studies from the Dismal Trade. New York: W. W. Norton, 1997. Mitford, Jessica. The American Way of Death Revisited. New York. Alfred A. Knopf, 1998. Pine, Vanderlyn R. Caretaker of the Dead: The American Funeral Director. New York: Irvington, 1975. Smith, Ronald G. E. The Death Care Industries in the United States. Jefferson, NC: McFarland, 1996.